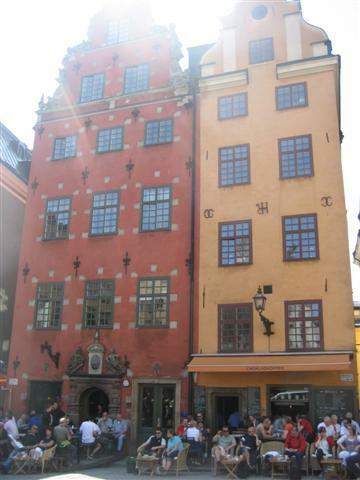 On one of the main squares in Gamla Stan is this wonderful cafe. Chokladkoppen is quite easy to spot; just look for the two tall colourful buildings, and the orange one is the one that you want. 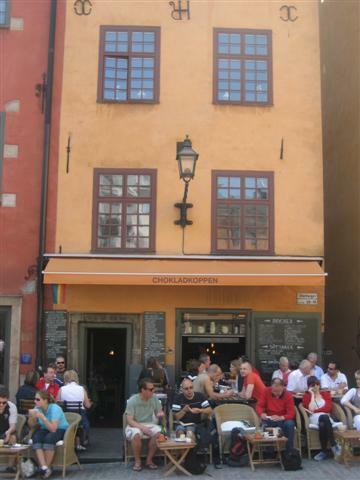 It is a fantastic cafe to sit and watch the world go by, especially on a hot sunny day. There are two types of seating outside; one on the decking and the other is the seating that comes out onto the square. If you’re having a meal, then it is nicer to sit on the wooden chairs on the higher level. If you’re just wanting to have drinks, then sitting on the comfy wicker chairs is a better option. 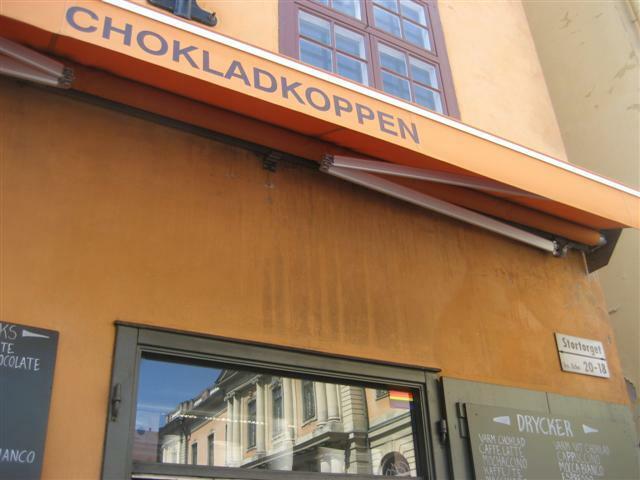 Chokladkoppen does a range of hot and cold drinks, sandwiches, lasagne, salads, soup, baked potatoes, pies, not to mention the big portions of cake. 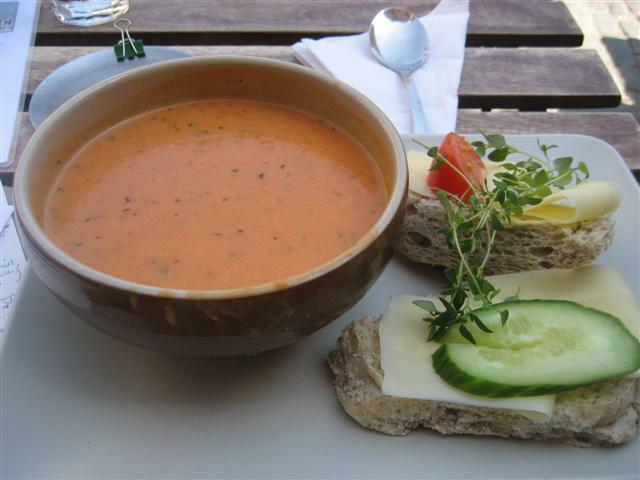 I decided to have the tomato soup as I was in the need of a hearty lunch and soup always seems to be a good option. I was served with a big bowl of soup and was just expecting some bread on the side. Instead, the soup came with two open cheese sandwiches. The soup had big chunks of tomato and it was quite creamy. The flavours of the herbs came through as well as the rich tomato flavour. The cheese was very thinly sliced so didn’t make the meal too heavy. The bread that it was came with was a light wholemeal roll. This lunch was perfect and it definitely filled me up until the evening. The staff were really friendly and gave service with a smile. They were helpful and gave the customers their time, even though the cafe was really busy. 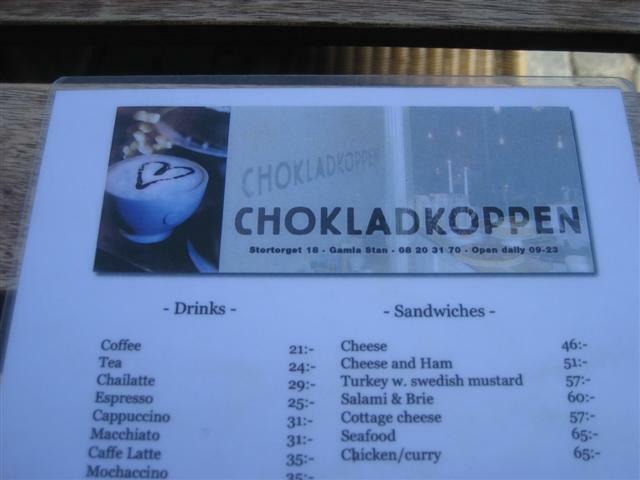 I can see why Chokladkoppen is a popular cafe. 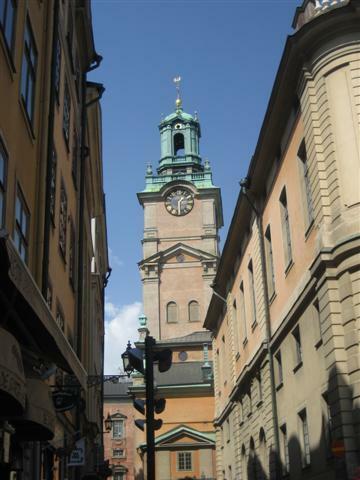 It has a great location in the old town of Gamla Stan, and is so close to lots of attractions such as Storkyrkan (Stockholm’s 700 year old cathedral) and Nobelmuseet (the Nobel Museum).